Canonical neutrophil antimicrobial effector mechanisms, such as degranulation, production of reactive oxygen species, and release of neutrophil extracellular traps (NETs), can result in severe pathology. Activation of neutrophils through immune complexes (ICs) plays a central role in the pathogenesis of many autoimmune inflammatory diseases. In this study, we report that immobilized ICs (iICs), which are hallmarks of several autoimmune diseases, induce the release of NETs from primary human neutrophils. The iIC-induced NET formation was found to require production of reactive oxygen species by NADPH oxidase and myeloperoxidase and to be mediated by FcγRIIIb. Blocking of the β2 integrin macrophage-1 Ag but not lymphocyte function–associated Ag-1 abolished iIC-induced NET formation. This suggests that FcγRIIIb signals in association with macrophage-1 Ag. As intracellular signaling pathways involved in iIC-induced NET formation we identified the tyrosine kinase Src/Syk pathway, which downstream regulates the PI3K/Akt, p38 MAPK, and ERK1/2 pathways. To our knowledge, the present study shows for the first time that iICs induce NET formation. Thus, we conclude that NETs contribute to pathology in autoimmune inflammatory disorders associated with surface-bound ICs. Polymorphonuclear neutrophil granulocytes are key players in the antimicrobial defense. One important antimicrobial effector mechanism is the release of extracellular fibrous structures, the so-called neutrophil extracellular traps (NETs) (1, 2). NETs are composed of chromatin, histones, and antimicrobial proteins and contribute to pathogen containment (1). To release NETs, activated neutrophils undergo a form of cell death that is distinct from apoptosis and necrosis, the so-called NETosis (1, 3), which is dependent on the formation of reactive oxygen species (ROS) and on NADPH oxidase (NOX) and myeloperoxidase (MPO) (3–7). In addition to ROS-dependent NETosis, few microorganisms and certain stimuli have been reported to induce NETs in an ROS-independent manner (8–11). However, the importance of ROS-dependent NETs for host defense is highlighted by patients with chronic granulomatous disease, patients who have mutations that inactive the NOX, or patients completely deficient in MPO whose neutrophils fail to produce ROS and NETs and suffer from severe recurrent infections (3, 12, 13). Besides ROS-producing enzymes, several enzymatic activities (14–19), specific signal transduction events (20), and engagement of β2 integrins (21, 22) are involved in NETosis, indicating a multifactorial process. Deregulation and defects of NETosis can contribute to inflammation and can lead to severe pathogenesis, because the cytotoxic agents of NETs can cause endothelial and tissue damage (19, 23–26). Additionally, NETs can activate plasmacytoid dendritic cells and thus enhance inflammation (27, 28). A pathophysiological role of NETs has been suggested in allergic, infectious, and autoimmune diseases (29). In autoimmune disorders NETs are not only proposed to potentiate autoimmunity/pathogenesis (effector inflammatory phase) but also to be involved in the afferent immune phase (generation of autoimmune response). Because NETs expose potential autoantigens such as histones, dsDNA, and granule enzymes they have been suspected to support production of autoantibodies and/or immune complexes (ICs) (30–33). The presence of autoantibodies against NET Ags and/or ICs that contain NET components can potentiate a proinflammatory response and further perpetuate an autoimmune inflammation (27, 28, 32, 34). In autoimmune diseases, both soluble and insoluble ICs provoke activation of neutrophils (35–38). Neutrophils isolated from synovial fluid from patients with rheumatoid arthritis (RA) exhibit an enhanced ROS (39, 40) and NET production (34). Pathogenic ICs that are formed on the extracellular matrix and thus are immobilized have been described in several autoimmune diseases (41–43). Whereas soluble ICs (sICs) have been shown to induce NET production by human neutrophils (11, 32, 34, 44), it remains unclear whether immobilized ICs (iICs) are also able to induce NETosis. Thus, the aim of this study was do determine whether iICs can stimulate NETosis of primary human neutrophils and to discover the underlying molecular mechanisms. We could clearly show that iICs stimulate the release of NETs in a ROS-dependent manner. Furthermore, we could show that FcyRIIIB and its signaling partner macrophage-1 Ag (Mac-1), which initiates Src/Syk signaling, mediate the activation process. As signaling pathways downstream of Src/Syk we identified the PI3K/Akt, ERK, and p38 MAPK pathways to be involved in iIC-induced NETosis. Sample collection was conducted with the understanding and the consent of each participant and was approved by the Ethical Committee of the Medical Faculty of the University of Lübeck (05-124). Peripheral heparinized blood was collected by venipuncture from healthy adult volunteers. Neutrophils were isolated as described previously using Percoll gradient centrifugation (45). Cell purity and viability were >99.9% as determined by morphological examination of Giemsa-stained cytocentrifuge slides. Plate-bound iICs were formed by using human serum albumin (HSA) Ag (Baxter) and rabbit polyclonal anti–HSA IgG (Sigma-Aldrich, Steinheim, Germany) as described previously (35). Briefly, 20 μg/ml HSA in 50 mM carbonate/bicarbonate buffer (pH 9.6) was coated overnight at 4°C to 96-well Lumitrac 600 (for chemiluminescence-based ROS detection) or Fluotrac 600 (for fluorescence-based NET detection) high-binding plates (Greiner Bio-One, Frickenhausen, Germany). After washing with PBS plus 0.05% Tween 20 (wash buffer), wells were blocked with 10% biotin-free BSA (low LPS; Carl-Roth, Karlsruhe, Germany) in PBS for 1 h at room temperature following 1 h incubation with anti–HSA IgG1 diluted 1:400 in PBS (∼10 μg/ml HSA-specific IgG). Finally, IC-coated wells were washed twice with wash buffer and once with assay medium. For microscope-based experiments ICs were coated as described above by using 100 μg/ml HSA to eight-well ibiTreat μ-slides (Ibidi, Martinsried, Germany) for fluorescence microscopy or to Thermanox coverlips (Nunc/Thermo Scientific, Rockford, IL) for scanning electron microscopy (EM). Uncoated wells, BSA-coated wells, and wells without the HSA Ag (BSA/IgG), without the anti–HSA IgG (HSA), or without has Ag and BSA blocking (IgG only) served as controls. F(ab′)2 fragments for preparation of iICs were obtained by using the ImmunoPure F(ab′)2 preparation kit (Thermo Scientific) following the manufacturer’s instructions. To exclude an apoptosis- or necrosis-inducing effect of media, iICs, inhibitors, antioxidants, or blocking Abs, viability of neutrophils was analyzed by flow cytometry using Annexin VFITC (Promokine, Heidelberg, Germany) and propidium iodide (PI) (Sigma-Aldrich) staining according to the manufacturer’s instructions. Cells were analyzed by flow cytometry using a FACSCalibur flow cytometer and the CellQuest Pro software (BD Biosciences, San Diego, CA). Neutrophils were preincubated for 30 min at 37°C in appropriate assay medium with freshly prepared inhibitors or antioxidants prior to exposure to iICs. To inhibit ROS pathways the NOX inhibitor diphenyleneiodonium chloride (DPI, 20 μM, Sigma-Aldrich) and the MPO inhibitor 4-dimethylaminoantipyrine (aminopyrine, 200 μM, Sigma-Aldrich) were used. As antioxidants with ROS scavenging activity l-ascorbic acid (1 or 2 mM, Sigma-Aldrich) and 5-aminosalicylic acid (5-ASA, 0.5 mM, TCI Europe, Eschborn, Germany) were used. Urea (1 mM) served as negative control. For analysis of signaling pathways, neutrophils were preincubated with 30 μM piceatannol (Syk inhibitor, Sigma-Aldrich), 10 μM PP2 (Src inhibitor, Calbiochem, Darmstadt, Germany), 25 μM LY29004 (PI3K inhibitor, Calbiochem), 10 μM UO126 (ERK inihibitor, Cell Signaling Technology, Beverly, MA), 9 μM VIII (Akt inhibitor, Calbiochem), or 10 μM SB 203580 (p38 MAPK inhibitor, Calbiochem). Solvent (DMSO 1:1000) and untreated neutrophils served as controls. In studies using FcγR-blocking Abs, neutrophils were incubated for 50 min at room temperature with 1 μg blocking Abs to FcγRI (anti-human CD64, clone 10.1, BioLegend, San Diego, CA), FcγRII (anti-human CD32, clone AT10, Abcam, Cambridge, U.K.), FcγRIIIB (anti-human CD16, clone 3G8, BioLegend), or isotype control Abs (mouse IgG1κ isotype, BioLegend) per 106 cells/ml. After washing, neutrophils were stimulated with iICs. To block Mac-1 (CD11b/CD18) or lymphocyte function–associated Ag-1 (LFA-1; CD11a/CD18) human neutrophils were preincubated in assay medium for 30 min at 37°C with 20 μg/ml blocking Ab to human CD11b (clone ICRF44), CD11a (clone Hl111), or CD18 (clone TS1/18) (all from BioLegend) or a combination of anti-CD11b/a with anti-CD18 prior to stimulation with iICs. Mouse IgG1κ isotype (BioLegend) and untreated cells served as controls. The sum of intra- and extracellular ROS, mainly H2O2 and MPO-generated metabolites, was measured by using luminol (46, 47). Neutrophils (2 × 106/ml) in CL medium (a modified RPMI 1640 medium without phenol red and sodium hydrogen carbonate containing 20 mM HEPES [Biochrom]) with 0.06 mM luminol (Sigma-Aldrich) were transferred to iIC-coated 96-well Lumnitrac 600 plates (Greiner Bio-One) and ROS-dependent chemiluminescence was analyzed using an Infinite 200 reader and the Tecan i-control 1.7 software (Tecan, Crailsheim, Germany). In some of the experiments, where 20 nM PMA was used as a stimulus, measurement was performed with neutrophils in suspension culture (nonimmobilized) in 96-well Nunclon Delta white microwell plates (Nunc, Langensbold, Germany). ROS release was monitored for 1 h every 2 min at 37°C. For statistical analysis the area under the curve (AUC) of each sample was calculated. The lucigenin-amplified chemiluminescence assay (46, 48) was performed the same way as the luminol assay, but with 0.2 mM lucigenin (Alexis, Lörrach, Germany) instead of luminol. This assay was used to analyze the extracellular superoxide production. To study the kinetics of NET release of neutrophils, the non–cell-permeable DNA dye Sytox Green (Invitrogen) was used (2, 4, 12). Neutrophils (106/ml) were incubated at 37°C in iIC-coated Fluotrac 600 plates (Greiner Bio-One) in NET medium containing 5 μM Sytox Green. In experiments using PMA as stimulus, neutrophils in suspension culture were incubated in 96-well Nunclon Delta black microwell plates (Nunc) and stimulated with 20 nM PMA. Where indicated, cells were pretreated for 15 min with 5 ng/ml TNF-α prior to iIC stimulation. The fluorescence of NET-bound Sytox Green (excitation, 488 nm, emission, 510 nm) was analyzed for 7 h every 5 min at 37°C using an Infinite 200 reader and Tecan i-control 1.7 software (Tecan). For statistical analysis the AUC of each sample was calculated. For visualization of NETs, fluorescence microscopy (FM) and EM were performed. For FM, 106 neutrophils/ml in NET medium were incubated for 7 h at 37°C in iIC-coated ibiTreat μ-slides (Ibidi). Following fixation with 4% paraformaldehyde (Sigma-Aldrich), staining of MPO and DNA by using mouse anti-human MPO (1:500, AbD Serotec, Düsseldorf, Germany) and Sytox Green was carried out as described previously (4, 48). Samples were analyzed with the AxioVert A.1 using the the AxioCam HRc and AxioVision release 4.8 software (all Carl Zeiss, Jena, Germany) or with the Keyence BZ-9000E using the BZ II analyzer software (Keyence, Neu-Isenburg, Germany). For EM, neutrophils (106/ml) in NET medium were settled on iIC-coated thermanox coverslips (Greiner Bio-One). Following incubation for 7 h at 37°C, the supernatant was removed and samples were fixed with 1 ml Monti-Graziadei solution and processed for EM as described (48). Preparates were examined with an EM505 (Philips, Eindhoven, The Netherlands). Neutrophils (5 × 106/ml in NET medium) were stimulated for 15 min at 37°C with iICs. In some experiments neutrophils were preincubated for 30 min with 20 μM DPI or 10 μM PP2. Following iIC stimulation, whole-cell lysates were prepared using TCA as described (49). Western blot analysis was carried out by using Abs against human phospho-Akt (Thr308), phospho-p44/42 MAPK (ERK1/2, Thr202/Tyr204), phospho-p38 MAPK (Thr180/Tyr182), phospho-PI3K p85 (Tyr458)/p55 (Tyr199), or β-actin (all from Cell Signaling Technology) and probed with HRP-conjugated anti-rabbit or anti-mouse IgG (New England Biolabs, Beverly, MA). The signal was detected by using Immobilon Western chemiluminescence HRP substrate (Millipore, Billerica, MA) and quantified by using the Fusion Fxt chemiluminescence reader and Bio1D software (Vilber Loumat, Eberhardzell, Germany). Signals of pAkt, pPI3K, pERK1/2, or pp38 were normalized to β-actin reprobed on the same blots. Statistical analysis was performed with the GraphPad Prism software 6 using the one-way ANOVA followed by a Bonferroni t test for multiple comparisons. Surface-bound iICs were generated by using HSA and rabbit anti–HSA IgG Abs. Immune complexes formed with rabbit IgG have been used previously in several studies with neutrophils (11, 35, 36, 50). Rabbit IgGs bind to human Fcγ receptors in a similar pattern as human IgG (11), and they activate human neutrophils (11, 35, 50). Thus, rabbit IgGs can be used as an equivalent alternative to human IgG. Light microscopy revealed neutrophil spreading in response to iICs (Fig. 1A), indicating activation of these cells. The iIC-induced shape changes were also evident upon flow cytometry in the forward light-scattering properties (Fig. 1B). The oxidative burst was assessed by using two different techniques. iICs induced both the production of MPO-dependent ROS (Fig. 1C) and superoxide (Fig. 1D). Controls (immobilized BSA, HSA, BSA/IgG, and IgG) induced no ROS production. Neither iICs nor the corresponding controls induced apoptosis or necrosis of neutrophils (Supplemental Fig. 1). iICs activate primary human neutrophils and induce the production of ROS. (A and B) Shape change/cell spreading of human neutrophils (2 × 106 /ml in NET medium) plated for 30 min at 37°C on immobilized HSA/anti-HSA immune complexes (iICs) as observed by (A) light microscopy (by using the AxioVert A.1 with ×40/0.75 Ph2 EC Plan-Neofluar objective, AxioCam HRc, and AxioVision release 4.8 software; scale bars, 20 μm) and (B) flow cytometry (changes in forward light scatter values) in comparison with neutrophils incubated on uncoated surfaces. Representative real-time kinetics and AUC values of (C) intra-/extracellular MPO-dependent ROS and (D) extracellular superoxide as measured by the luminol- and lucigenin-amplified chemiluminescence assays, respectively, are shown. Real-time analysis of ROS production was monitored for 1 h at 37°C from neutrophils (2 × 106 /ml in CL medium) incubated on iICs and controls (uncoated or plate-bound BSA, HSA, BSA/IgG, IgG); n = 3–10 independent experiments. Values are means ± SEM. ****p < 0.0001 as compared with the uncoated sample. Having observed that iICs induce ROS production in neutrophils (Fig. 1), we next assessed the effect of iICs on the formation of NETs. iICs significantly induced NET release by human neutrophils as detected by real-time kinetics (Fig. 2A). Preincubation of neutrophils with TNF-α significantly increased iIC-induced NET production (Fig. 2B). When compared with PMA, a well-characterized inducer of ROS-dependent NETosis, NETs induced by iICs/TNF-α occurred later and to a lesser extent (Fig. 2A). iICs induce the release of NETs from human neutrophils. (A and B) Representative real-time kinetics (upper panels) and AUC values (means ± SEM, lower panels) of NET-dependent relative fluorescence intensities (RFU) as measured by the Sytox Green assay. Real-time generation of NETs was monitored for 7 h at 37°C from neutrophils (106/ml in NET medium) incubated on iICs or controls (uncoated or plate-bound BSA, HSA, BSA/IgG, IgG) or from neutrophils pretreated with 5 ng/ml TNF-α prior to iIC stimulation (iIC + TNF-α). PMA (20 nM) stimulation served as positive control; n = 3–12 independent experiments. *p < 0.05, ***p < 0.001, ****p < 0.0001 as compared with the HSA-coated control. (C) Representative FM and EM images of neutrophils incubated on HSA-coated or iIC-coated surfaces. Cells (106/ml in NET medium) were fixed after 7 h incubation at 37°C. For FL microscopy DNA was stained with Sytox Green, and overlay of brightfield and green fluorescence is shown. Scale bars, 40 μm for FL microscopy, 10 μm for ×170 EM, and 5 μm for ×2500 EM. FM images were taken with AxioVert A.1 with ×40/0.75 Ph2 EC Plan-Neofluar objective, AxioCam HRc, and AxioVision release 4.8 software. EM images were taken with an EM505. (D) Representative FM images of immunohistochemical staining. Following 7 h of incubation with plate-bound HSA or iICs, neutrophils (106/ml in NET medium) were fixed and stained for DNA by using Sytox Green (green) and for MPO (red) by using mouse anti-human MPO and goat anti-mouse Cy3-conjugated IgG. Overlay of DNA and MPO is shown in yellow. Scale bar, 20 μm. Images were taken with Keyence BZ-9000E using a ×40 Plan Fluor EL NA 0.60 Ph2 objective and BZ II analyzer software. FM and EM analyses confirmed a NET-inducing effect of iICs (Fig. 2C, 2D). Neutrophils incubated on iICs released complex fibrous or cloud-like structures (Fig. 2C, 2D). Immunohistochemical staining confirmed that these NET structures (Fig. 2D, arrows) contained decondensed DNA (Fig. 2D, green) and MPO (Fig. 2D, red). Neutrophils that undergo NETosis are characterized by the loss of the multilobated nuclear morphology, chromatin decondensation, and intermixing of DNA and granular proteins (MPO) (Fig. 2D, arrowhead). Because iICs induced the respiratory burst (Fig. 1) and the release of NETs (Fig. 2), we next aimed to clarify whether NOX- and MPO-dependent ROS were involved in iIC-induced NETosis. Neutrophils were pretreated with the NOX inhibitor DPI or the MPO inhibitor aminopyrine prior to iIC stimulation. A toxic effect of these inhibitors was excluded by annexin V/PI staining (data not shown). The lucigenin-amplified chemiluminescence assay is a sensitive technique to detect superoxide anions (4, 46). Inhibition of NOX by DPI nearly completely abolished superoxide production (Fig. 3B). Consequently, ROS generated downstream of NOX such as MPO-dependent ROS, which can be measured by the luminol-amplified chemiluminescence assay (4, 46, 47), were also abolished (Fig. 3A). Aminopyrine exerted a strong inhibitory effect on MPO-dependent ROS as measured by the luminol assay (Fig. 3A) but not on superoxide as measured by the lucigenin assay (Fig. 3B). Lucigenin specifically emits light upon reaction with superoxide, but it is not excited by MPO-derived ROS (46, 51). MPO-derived metabolites are responsible for the excitation of luminol (46). Therefore, these results indicate that aminopyrine specifically inhibits the MPO- but not the superoxide-producing NOX. The Sytox Green assay as well as FM and EM revealed a significant inhibitory effect of both DPI and aminopyrine on the production of NETs in response to iICs (Fig. 3C, 3D). iICs induce NET release in an ROS-dependent manner. Human neutrophils were pretreated for 30 min at 37°C with 20 μM DPI (NOX inhibitor), 200 μM aminopyrine (MPO inhibitor), DMSO (1:1000, solvent control), or left untreated (medium) before incubation with iICs. (A) Luminol- and (B) lucigenin-amplified chemiluminescence was monitored for 1 h at 37°C from 2 × 106 neutrophils/ml in CL medium and (C) fluorescence intensities of NET-bound Sytox Green for 7 h at 37°C from 106 neutrophils/ml in NET medium. Representative real-time kinetics (left panels) and AUC values (means ± SEM from six independent experiments, right panels) of luminol, lucigenin, and Sytox Green intensities are shown. ***p < 0.001, ****p < 0.0001 as compared with solvent control (DMSO). (D) Representative EM and FM images of untreated (medium), DPI-treated, or aminopyrine-treated neutrophils incubated on iIC-coated surfaces. Cells (106/ml in NET medium) were fixed after 7 h of incubation. For FM, DNA was stained with Sytox Green and images were taken with an AxioVert A.1 with ×63/1.25 Oil EC Plan-Neofluar objective, AxioCam HRc, and AxioVision release 4.8 software. Overlay of brightfield and green fluorescence is shown. EM images were taken with an EM505. Scale bars, 20 μm for FM and 5 μm for EM. To substantiate the role of ROS in iIC-induced NET release, we used the antioxidants 5-ASA and l-ascorbic acid. The antioxidative effect of these substances is related to their ability to scavenge ROS (52, 53). Both substances exerted a scavenging effect on intra-/extracellular MPO–dependent ROS (Fig. 4A), but only 5-ASA had such an effect on extracellular superoxide (Fig. 4B). In the NET assay, all substances that scavenged MPO-dependent ROS significantly decreased iIC-induced NETosis (Fig. 4C). The inhibitory effect of antioxidants on NET release was also obvious in EM (Fig. 4D) and FM (data not shown) and further confirms that iICs induce NETs in a ROS-dependent manner. Antioxidants inhibit the formation of iIC-induced NETs. Human neutrophils were pretreated for 30 min at 37°C with 1 or 2 mM l-ascorbic acid (Asc), 0.5 mM 5-ASA, or 1 mM urea or left untreated (medium) before incubation with iICs. (A) Luminol- and (B) lucigenin-amplified chemiluminescence was then monitored for 1 h at 37°C from 2 × 106 neutrophils/ml in CL medium, and (C) fluorescence intensities of NET-bound Sytox Green for 7 h at 37°C from 106 neutrophils/ml in NET medium. AUC values (means ± SEM from three independent experiments) of luminol, lucigenin, and Sytox Green intensities are shown. *p < 0.05, **p < 0.01, ***p < 0.001 as compared with medium control. (D) For EM, neutrophils were fixed after 7 h incubation at 37°C on iICs. Representative EM images for neutrophils treated with urea, 5-ASA, and Asc are shown in comparison with untreated (iICs) and unstimulated (HSA) neutrophils. EM images were taken with an EM505. Scale bars, 10 μm for ×170 magnification and 5 μm for ×2500 magnification. It is known that activation of neutrophils through ICs is mediated by FcγRs. To check whether iIC-induced NETosis is mediated through FcγRs, neutrophils were stimulated with iICs containing F(ab′)2 fragments of the anti–HSA Ab instead of the full anti–HSA IgG. iICs with F(ab′)2 fragments failed to induce the oxidative burst of human neutrophils (Fig. 5A, 5B) and also failed to stimulate the release of NETs (Fig. 5C, 5D). These results suggest that binding to FcγR is a crucial step for the iIC-induced NET formation. 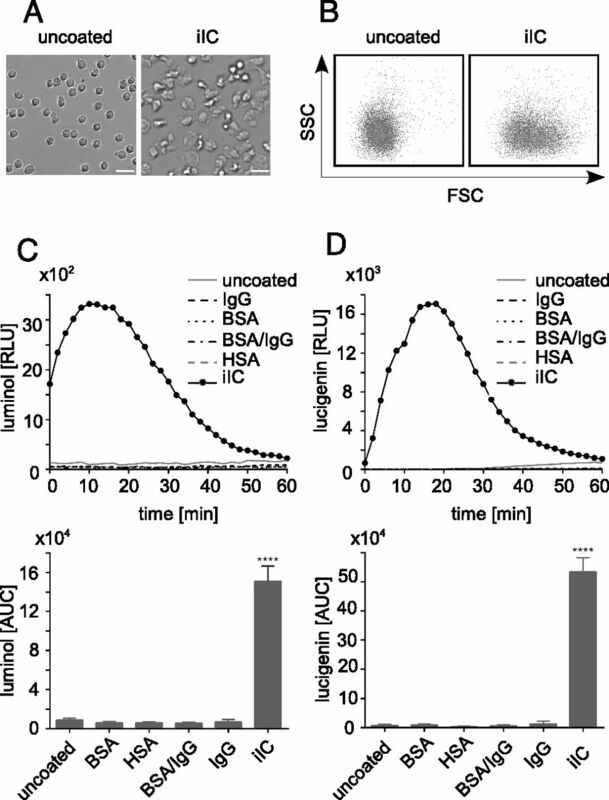 iIC-induced NET release from human neutrophil granulocytes depends on FcγRIIIb. (A and B) ROS production and (C and D) NET release was measured after exposure of neutrophils to immobilized HSA/anti–HSA IgG1 or to HSA/anti–HSA F(ab′)2. AUC values (means ± SEM) are shown for (A) the luminol- and (B) lucigenin-amplified chemiluminescence assays (2 × 106 cells/ml) as monitored within 1 h at 37°C and (C) the Sytox Green assay (106 cells/ml) as monitored within 7 h at 37°C. Mean AUC values (means ± SEM) of luminol (n = 4), lucigenin (n = 4), and Sytox Green (n = 3) intensities are shown. **p < 0.01, ****p < 0.0001. (D) NETs were visualized by EM (left panels; using EM505) and FM (right panel) after 7 h at 37°C (106 cells/ml). For FM, DNA was stained with Sytox Green and overlay of brightfield and green fluorescence is shown. Images were taken with an AxioVert A.1 with ×40/0.75 Ph2 EC Plan-Neofluar objective, AxioCam HRc, and AxioVision release 4.8 software. Scale bars, 5 μm for EM and 20 μm for FM images. HSA-F(ab′)2, HSA/anti–HSA F(ab′)2 immune complex with deleted Fc portion; HSA-IgG1, HSA/anti–HSA IgG1 immune complex. (E–G) ROS and NET production of neutrophils pretreated for 50 min with blocking Abs (1 μg/106 cells/ml) to FcγRI, FcγRIIa, FcγRIIIb, or their isotype control Abs in response to iICs was measured by using (E) luminol, (F) lucigenin, and (G) Sytox Green. Representative real-time kinetics (left panels) and mean AUC values (means ± SEM, right panels) of luminol (n = 5), lucigenin (n = 4), and Sytox Green (n = 5) intensities are shown. *p < 0.05, **p < 0.01, ***p < 0.001 as compared with isotype control. Resting human neutrophils constitutively express two types of FcγRs on their surface, FcγRIIA (CD32) and FcγRIIIB (CD16). FcγRI is expressed by activated neutrophils (54). We investigated whether FcγRI, FcγRIIA, or FcγRIIIB is involved in iIC-induced ROS and NET production. For this purpose, neutrophils were incubated with blocking Abs to FcγRI, FcγRIIA, FcγRIIIB, or isotype control and production of ROS and NETs in response to iICs was analyzed. Activation of iIC-induced oxidative burst clearly depended on stimulation of both FcγRIIA and FcγRIIIB (Fig. 5E, 5F). In the NET assay only blocking of FcγRIIIB, but not of other FcγRs, resulted in a decrease of Sytox Green fluorescence, indicating that NET release is mediated solely by FcγRIIIB (Fig. 5G). These data indicate that both receptors, FcγRIIA and FcγRIIIB, are required for iIC-induced oxidative burst whereas only FcγRIIIB is sufficient for iIC-induced NET release. Western blot analysis of iIC-stimulated neutrophils revealed an enhanced phosphorylation of PI3K, Akt, ERK1/2, and p38 MAPK (Fig. 6A). To investigate whether these intracellular signaling pathways are involved in NETosis, inhibitors of these signaling molecules and potentially involved upstream pathways (Src, Syk) were used. Neutrophils were pretreated with inhibitors of Src (PP2), Syk (piceatannol), PI3K (LY29004), ERK1/2 (UO126), Akt (VIII), p38 MAPK (SB 203580), or solvent control (DMSO) prior to stimulation with iICs (Fig. 6B–E). A toxic effect of the inhibitors was excluded by annexin V/PI staining and microscopy (data not shown). Inhibition of Syk, Src, and PI3K drastically inhibited iIC-induced ROS production (Fig. 6B, 6C). Blocking of PI3K/Akt, ERK1/2, and p38 MAPK pathways also resulted in diminished ROS production (Fig. 6B, 6C).Treatment of neutrophils with Syk, Src, or PI3K inhibitors also blocked NET production in response to iICs (Fig. 6D, 6E). ERK1/2 inhibition nearly completely abolished NET formation, whereas treatment with inhibitors of Akt and p38 MAPK partially inhibited NET formation in response to iICs (Fig. 6D, 6E). Src/Syk-dependent signaling pathways are involved in iIC-induced NET release by human neutrophils. (A) Neutrophils (5 × 106 cells/ml) were incubated with medium, immobilized HSA, IgG, or iICs at 37°C and whole-cell lysates were prepared after 15 min. Whole-cell lysates were separated in 10% SDS-PAGE and Western blots were performed. Phosphorylation of PI3K, Akt, ERK1/2, and p38 MAPK was analyzed by using phospho-PI3K p85 (Tyr458)/p55 (Tyr199), phospho-p44/42 MAPK (ERK1/2, Thr202/Tyr204), phospho-Akt (Thr308), and phospho-p38 MAPK (Thr180/Tyr182) mAbs. Equal loading was shown by reprobing with anti-human β-actin Abs. Blots shown are representative of three independent experiments. (B–E) Neutrophils were pretreated for 30 min with 30 μM piceatannol (Syk inhibitor), 10 μM PP2 (Src inhibitor), 25 μM LY29004 (PI3K inhibitor), 10 μM UO126 (ERK inihibitor), 9 μM VIII (Akt inhibitor), 10 μM SB 203580 (p38 MAPK inhibitor), or solvent (DMSO 1:1000) before incubation with iICs. ROS production was analyzed by (B) luminol- and (C) lucigenin-amplified chemiluminescence assays (2 × 106 cells/ml in CL medium for 1 h at 37°C). NET release was monitored by (D) Sytox Green assay and visualized by (E) FM after 7 h of incubation with iICs at 37°C (106 cells/ml in NET medium). In (B)–(D) mean AUC values (means ± SEM from three to five independent experiments) of luminol, lucigenin, and Sytox Green intensities are shown. **p < 0.01, ***p < 0.001, ****p < 0.0001 as compared with solvent control (DMSO). For FM (E) DNA was stained with Sytox Green and overlay of brightfield and green fluorescence is shown. Scale bars, 20 μm. (F–I) Neutrophils (5 × 106 cells/ml) were preincubated for 30 min with 10 μM PP2 (Src inhibitor), 20 μM DPI (NOX inhibitor), or solvent control (DMSO) prior to 15 min incubation with iICs. Phosphorylation of PI3K (p55), Akt, ERK, and p38 was analyzed by Western blotting of whole-cell lysates. Blots shown are representative of three independent experiments. For quantification the signals of pPI3K, pAkt, pERK, and pp38 were normalized to the β-actin signal detected on the same blot or from the same samples. *p < 0.05, **p < 0.01 as compared with solvent control (DMSO). It has been reported for PMA-induced NETosis that phosphorylation/activation of ERK1/2 and p38 MAPK, which lead to formation of NETs, are mediated by ROS (55). Thus, we next investigated whether ROS are also required for phosphorylation of PI3K, Akt, ERK1/2, or p38 MAPK in iIC-induced NETosis, or whether Src family kinases are the critical upstream component of these signal transduction pathways. To address this question, neutrophils were treated with the NOX inhibitor DPI or the Src inhibitor PP2 prior to stimulation with iICs. Phosphorylation of PI3K, Akt, ERK1/2, and p38 MAPK was investigated by Western blot analysis. Treatment with the Src-inhibitor PP2 prevented phosphorylation of PI3K, Akt, ERK1/2, and p38 MAPK in iIC-stimulated neutrophils, whereas DPI treatment did not significantly affect their phosphorylation (Fig. 6F–I). These results indicate that activation of PI3K, Akt, ERK1/2, or p38 MAPK results directly from Src family kinases/receptor activation and is not ROS mediated. To investigate whether the iIC-induced signaling events leading to NET release are specific for iIC-induced NETosis or common for ROS-dependent NETosis, we performed signaling-inhibition studies with nonimmobilized neutrophils stimulated with PMA (Supplemental Fig. 2). PMA is the best characterized inducer of ROS-dependent NETosis. PMA-induced NETosis was shown to be mediated through the ERK and p38 MAPK pathways (20, 55). We could observe a role for the ERK but not for the p38 MAPK pathway in PMA-induced ROS and NET production (Supplemental Fig. 2). In addition to ERK we found Syk to be involved in PMA-dependent ROS and NET production (Supplemental Fig. 2). Src and the PI3K/Akt pathways were not directly involved in PMA-induced NET production (Supplemental Fig. 2C). However, blocking of these molecules resulted in a partial decrease in ROS production as measured by the luminol or lucigenin assay (Supplemental Fig. 2A, 2B). These results suggest that receptor/Src activation and the PI3K/Akt pathways are specific for iIC-induced NETosis, whereas Syk and ERK activation are also involved in PMA-induced ROS-dependent NETosis. FcγRIIIB is a GPI-linked receptor missing transmembrane and cytoplasmic domains (56). The fact that FcγRIIIB-mediated NET release in response to iICs involves Src/Syk pathways (Fig. 5) suggests that FcγRIIIB utilizes signaling molecules associated with other receptors or that other receptors, in addition to FcγRIIIB, are involved in NET induction. FcγRIIA and the β2 integrin Mac-1, which both require Syk-dependend signaling, have been described as signaling partners of FcγRIIIB (57–60). Because we observed that blocking of FcγRIIA did not inhibit the formation of iIC-induced NETs (Fig. 5G), we investigated whether the β2 integrin Mac-1 plays a role. Mac-1 is composed of a β2 subunit (CD18) that is noncovalently associated with an α subunit (CD11b). Whereas blocking of CD18 had no effect on ROS production (Fig. 7A, 7B), we observed an inhibitory effect on extracellular superoxide when CD11b was blocked (Fig. 7B). Blocking of both CD11b or CD18 substantially decreased iIC-induced NET release whereas simultaneous blocking of CD11b and CD18 completely abolished NET formation (Fig. 7C–E). These data suggest that not only FcyRIIIB but also the β2 integrin Mac-1 (CD11b/CD18) is required for iIC-induced NET formation. The β2 integrin Mac-1 (CD11b/CD18) but not LFA-1 (CD11a/CD18) is involved in iIC-induced NET release. Human neutrophils were pretreated for 30 min at 37°C with 20 μg/ml blocking Abs specific to CD11a, CD11b, CD18, CD11b plus CD18 (Mac-1), CD11a plus CD18 (LFA-1), isotype Abs, or left untreated (medium) before incubation with iICs. (A–E) Mac-1 blocking studies (n = 3) and (F–I) LFA-1 blocking studies (n = 5). ROS production was analyzed by (A and F) luminol- and (B and G) lucigenin-amplified chemiluminescence assays (2 × 106 cells/ml in CL medium for 1 h at 37°C). Fluorescence intensities of NET-bound Sytox Green were detected during a period of 7 h at 37°C from 106 neutrophils/ml in NET medium. (C and H) Representative real-time kinetics and (D and I) normalized mean AUC values (means ± SEM, data normalized to untreated iIC control) of Sytox Green intensities are shown. *p < 0.05, **p < 0.01, ***p < 0.001 as compared with isotype control. (E) Representative EM images of untreated, CD11b-blocked, CD18-blocked, or CD11b plus CD18 (Mac-1)–blocked neutrophils incubated on iICs are shown. Cells (106/ml in NET medium) were fixed after 7 h incubation on iICs at 37°C. Images were taken by using an EM505. Scale bar, 5 μm. In addition to Mac-1, neutrophils constitutively express the β2 integrin LFA-1 (61). LFA-1 is structurally similar to Mac-1, as it is composed of the common β2 subunit (CD18) associated with a respective α subunit (CD11a) (61). Thus, we next addressed the question whether LFA-1 (CD11a/CD18) plays any role in iIC-induced NETosis. Blocking of CD11a, CD18, or LFA-1 (CD11a/CD18) had no effect on iIC-induced ROS production (Fig. 7F, 7G). Blocking of CD11a alone had also no inhibitory effect on iIC-induced NET production, whereas blocking of CD18, which is also part of Mac-1, partially inhibited the NET production (Fig. 7H, 7I). Blocking of CD11a and CD18 in combination had no additional inhibitory effect on iIC-induced NET production, as compared with CD18 blocking alone (Fig. 7H, 7I). These results indicate that the β2 integrin LFA-1 is not involved in iIC-induced ROS and NET production and that the β2 integrin Mac-1 has a unique role. Activation of neutrophils through ICs plays a central role in the pathogenesis of several autoimmune inflammatory diseases. Dysregulation of the release or defects of the clearance of NETs are thought to contribute to autoimmunity and inflammation (29) and have been described for systemic lupus erythematosus (27, 28, 30, 62), small vessel vasculitis (32), MPO/anti-neutrophil cytoplasmic Ab–associated vasculitis (63), lupus nephritis (30), psoriasis (64, 65), RA (34), and gouty arthritis (66). In several autoimmune diseases ICs not only occur as circulating sICs, but are formed on extracellular matrix/solid surface and are thus immobilized (41–43). Although both sICs and iICs provoke priming and activation of neutrophils and concomitant tissue damage (11, 35–38, 67, 68), it remained unclear whether iICs are able to induce NETosis. To our knowledge, our data demonstrate for the first time that iICs stimulate the release of NETs from human primary neutrophils. In response to most stimuli NETs are released during a programmed, lytic cell death, the so-called NETosis, which occurs within hours and is mediated by ROS produced by NOX and MPO (3, 4, 6, 7, 69–71). This cell death has been shown to be involved in autoimmune inflammatory diseases such as RA (34) or systemic lupus erythematosus (27, 72). However, a ROS-independent, rapid (5–60 min) induction of NET release has been recently described upon endocytosis of sICs (11). In contrast, our data show that iICs induce the typical NETosis, which requires hours and depends on ROS. By using pharmacological inhibitors of NOX or MPO as well as by treatment of cells with antioxidants, which scavenge ROS but do not affect the ROS-producing enzymes, we could not only reduce the iIC-induced oxidative burst, but also the release of NETs. Thus, NOX/MPO activity and ROS are important players controlling iIC-induced NETosis. IC-induced activation of neutrophils is mediated by FcγRs that are expressed on the cell surface of most immune cells. Engagement of FcγRs not only triggers several antimicrobial functions such as recognition and phagocytosis of IgG-opsonized pathogens, degranulation, and oxidative burst, but also plays an important role in IC-mediated inflammatory processes and the development of autoimmune diseases (55, 73, 74). Mice deficient in the γ-chain and thus lacking all activating FcγRs have significant defects in IC-dependent effector cell responses (73, 75) and are resistant to induction of various IC-induced autoimmune diseases (74, 76–78). Furthermore, FcR polymorphisms and/or disturbed FcγR expression have been described in patients with autoimmune diseases (74, 79–81). These data indicate that a wide range of inflammatory and autoimmune diseases are triggered by FcγR-mediated activation of inflammatory cells. Activating FcγRs expressed on resting human neutrophils are FcγRIIIB and FcγRIIA (74, 82), which both mediate activation of neutrophils by ICs (11, 35, 50, 82–85). The high-affinity ITAM-bearing FcγRI is expressed upon activation of neutrophils by inflammatory stimuli and can bind monomeric IgG (86). We could show that iICs induce a robust respiratory burst through engagement of both FcγRIIA and FcγRIIIB. Nevertheless, only engagement of FcγRIIIB but not FcγRIIA seems to be required for iIC-induced NETosis. This indicates that NETosis is a multifactorial process that not only requires ROS, but also demonstrates that distinct activation and signaling events are necessary. The GPI-linked FcγRIIIB lacks transmembrane and cytoplasmic signaling domains (56) but can signal in association with FcγRIIA and/or the β2 integrin Mac-1, which both initiate Syk-dependent signaling (57–60, 87). We identified Mac-1 and the associated signal molecules Src, Syk, and PI3K to play an essential role in iIC-induced NETosis. These results suggest that, as a consequence of iIC stimulation, FcγRIIIB and Mac-1 get activated and that interactions of both receptors induce outside–in signaling pathways leading to NET formation. This assumption is in line with previous studies describing that FcγRIIIB utilizes signaling molecules associated with Mac-1 and/or crosstalk/interactions of both receptors are necessary for neutrophil activation/cytotoxic functions (57–60, 82, 87). Surprisingly, Mac-1 is not involved in NET induction upon endocytosis of sICs, which is mainly mediated by FcγRIIA, whereas FcγRIIIB plays a minor role in this process (11), possibly through its ability to capture ICs and subsequently activate FcγRIIA (11, 87). This suggests that FcγRIIIB can mediate signaling independent of its known signaling partners. Therefore, we cannot rule out that in addition to FcγRIIIB and Mac-1 other routes of activation are involved in iIC-induced NETosis. Nevertheless, our data clearly reveal that the β2 integrin Mac-1, in addition to FcγRIIIB, is a key player in iIC-induced NETosis, similar to NET induction through TLRs, fMLP, or TNF, where engagement of Mac-1 is also essential (21, 88). Mac-1 seems to play a minor role in iIC-induced ROS production, because we observed only a slight inhibition of extracellular superoxide upon Mac-1 blocking and no effect on MPO-dependent ROS. In addition to Mac-1, neutrophils constitutively express the β2 integrin LFA-1, which is structurally similar to Mac-1, as it is composed of the common β2 subunit (CD18) associated with a respective α subunit (CD11a) (61). It has been reported recently in a mouse model and for primary human neutrophils that NET release in response to LPS-stimulated platelets is mediated via LFA-1 (89). On the contrary, LFA-1 is not involved in NET production induced by TNF-related activation protein–stimulated platelets, which was shown to be mediated by Mac-1 (22). In our present study we could not observe a role for LFA-1 either in iIC-induced ROS or in NET production. This indicates that the β2 integrin Mac-1 but not LFA-1 plays a role in iIC-induced outside–in signaling leading to the formation of NETs. Downstream of FcγRIIIB and Mac-1 we identified tyrosine kinases, particularly of the Src and Syk families, and PI3K to play a key role in iIC-induced NETosis. These kinases are not only known to be key mediators of FcγR signaling, but they are also required for integrin signaling in neutrophils (58, 90, 91) and thus fit to our model that FcγRIIIB signals in association with Mac-1. Syk pathways have also been shown to be involved in sIC-induced activation of neutrophils and NET formation (11, 44, 92). Syk deficiency or blocking of Syk hinders FcγR-mediated NET formation in response to sICs (11, 44, 93) and, additionally, protects mice almost completely from disease development in a collagen Ab–induced arthritis model (44). Thus, Syk pathways could serve as a target for drug application to affect the development of IC-mediated autoimmune diseases. Interestingly, we observed that Syk is not only involved in integrin-mediated iIC-induced NETosis, but also in PMA-stimulated ROS and NET production. The nonphysiological agent PMA directly activates protein kinase C (94) and thus does not require cell surface receptors such as β2 integrins and bypasses receptor-mediated signaling such as Src and Syk. Indeed, in PMA-induced NETosis we could not observe a role for Src family kinases, which are directly associated with receptor activation. However, our results indicate a role of Syk in PMA-induced NETosis. A role for PMA in Syk activation was also described by others. It was shown that PMA induces a protein kinase C–dependent phosphorylation of Syk in human neutrophils (95) and that inhibition of Syk with piceatannol results in a decreased production of intra- and extracellular ROS in response to PMA (96), which is in line with our observations. Thus, we conclude that receptor/Src activation is required for iIC-induced but not PMA-induced NETosis, whereas Syk activation is also involved in PMA-induced ROS-dependent NETosis. In addition to Src and Syk, we identified the PI3K/Akt, ERK1/2, and p38 MAPK pathways to be involved in iIC-induced NETosis. We could show that phosphorylation of PI3K, Akt, ERK1/2, and p38 MAPK results directly from Src family kinases/receptor activation and is not mediated by ROS, as it has been described for p38 MAPK and ERK1/2 upon stimulation with PMA (55). All of these downstream pathways are major signaling pathways used in regulation of neutrophil functions such as chemotaxis, migration, degranulation, and oxidative burst (97–100). The ERK and p38 MAPK pathways are also implicated in ROS-dependent NET formation upon PMA stimulation (20, 55). We could also observe a role for ERK but not for p38 MAPK in PMA-induced ROS and NET production. That we could not detect a diminished NET production upon inhibition of p38 MAPK may be due to our experimental settings. The study describing a role for p38 MAPK was done with immobilized and not suspended neutrophils and another p38 inhibitor was used (55). Moreover, it has been reported by others that the inhibitor we used (SB203580) does not inhibit PMA-induced superoxide production (101, 102). Recently, ERK has been shown to be involved in sIC-induced NET formation mediated by FcγRIIA (11). Because MAPKs, such as ERK1/2 and p38 MAPK, are associated with activation of neutrophils upon FcγR and integrin engagement (93, 103, 104), it is not surprising that we observed a role of these molecules in iIC-induced NETosis. We also identified the PI3K/Akt pathway to play a role in iIC-induced NETosis. This pathway is crucial in the initiation of autophagy (105–107), which has been shown to be required for PMA-induced NET formation (70, 108). Interplay between PI3K signaling, autophagy, and NET formation has been described in acute gout inflammatory arthritis (66) and in sepsis (108). PI3K generates phosphatidylinositol (3,4,5)-trisphosphate, which influences the transcription factor NF-κB (109). NF-κB activation leads to transcription of proinflammatory genes and is relevant in the signaling leading to NET release (110). Moreover, the PI3K signaling is connected via Akt with the mammalian target of rapamycin (111), which has been shown to play a role in NET formation (112). Therefore, it is reasonable to assume that PI3K activation by iICs leads to initiation of autophagy and/or to NF-κB and mammalian target of rapamycin activation in neutrophils. However, this issue was not addressed within this study and needs to be clarified. We identified Src, Syk, PI3K/Akt, ERK1/2, and p38 MAPK to play a role in iIC-induced NETosis. All of these signaling molecules are associated with intracellular Mac-1 signaling pathways (113). In this signaling scenario the MPO may play an important role. MPO, which is released during NETosis from the azurophilic granules, is a component of NETs and has been described as a ligand of Mac-1 on human neutrophils (113, 114). Binding of MPO to Mac-1 results in upregulation of Mac-1 expression, increased tyrosine phosphorylation, and activation of p38 MAPK, ERK1/2, PI3K, and NF-κB (113). These signal pathways lead to ROS production, degranulation, transcription of proinflammatory genes, and recruitment of neutrophils (113), suggesting that MPO-dependent activation of Mac-1 may amplify the iIC-induced inflammation and contribute to tissue damage. Because ROS and NETs play a pathophysiological role in several autoimmune diseases (31, 115), inhibition of iIC-induced NET release could result in beneficial therapeutic effects in neutrophil-mediated autoinflammatory diseases. Because iIC-induced NETosis depends on ROS, any molecule that inhibits generation of ROS or scavenges ROS could be a possible therapeutic agent. We could show that inhibitors of NOX and MPO as well as antioxidants, such as 5-ASA and vitamin C, which act as scavengers against superoxide, hydroxyl radicals, and hypochlorite (48, 52), are able to reduce iIC-induced ROS and NETosis. Thus, these substances may mediate a therapeutic effect in autoimmune diseases. This assumption is supported by studies in which treatment of RA neutrophils with the antioxidant N-acetly-l-cysteine led to reduced NETosis (34) or in which adjuvant treatment of patients with anti-neutrophil cytoplasmic Ab–associated vasculitis with vitamin C led to reduced superoxide production by neutrophils (116). However, in addition to ROS, targeting of one of the intracellular signaling pathways involved in iIC-induced NETosis (Syk, PI3K/Akt, ERK, p38 MAPK) may be considered as a therapeutic strategy. In this study, we demonstrate for the first time, to our knowledge, that iICs induce ROS-dependent NETosis of human neutrophils, which is enhanced in the presence of the proinflammatory mediator TNF-α. This indicates that an (auto)inflammatory milieu, characterized by iICs and proinflammatory cytokines, is highly potent regarding the induction of NETs in the absence of microbial stimuli. Our results implicate that FcyRIIIB and Mac-1 engagement, signaling throughout the Src/Syk pathway, and ROS are crucial for the formation of NETs in response to iICs. Additionally, the PI3K/Akt, ERK1/2, and p38 MAPK pathways are involved in the intracellular signaling leading to NET formation. Thus, as compared with sICs, iICs use distinct activation mechanisms to induce NET release from human neutrophils. This demonstrates that the molecular mechanism of NET production is a multifactorial and stimulus-dependent process and thus disease specific. We thank Christo Örün (Institute of Anatomy, University of Lübeck) for technical support in EM and Tina Kirchner (Institute for Medical Microbiology and Hygiene, University of Lübeck) for assistance in antioxidant studies. M.B. designed the study, performed research, analyzed the data, interpreted the results, performed statistical analysis, and wrote the manuscript; C.L. performed the burst and neutrophil extracellular trap kinetic experiments; S.M. and T.B. performed the antioxidant studies and S.M. gave technical support; M.K. contributed scanning electron microscopy; and W.S. and T.L. participated in the interpretation of the results and contributed to writing the manuscript. This work was supported by University of Lübeck (Medical Faculty) Grant E14-2010.
. 2012. Neutrophil extracellular traps: is immunity the second function of chromatin? J. Cell Biol. 198: 773–783.
. 2004. Neutrophil extracellular traps kill bacteria. Science 303: 1532–1535.
. 2012. The impact of various reactive oxygen species on the formation of neutrophil extracellular traps. Mediators Inflamm. 2012: 849136.
. 2010. Human myeloperoxidase in innate and acquired immunity. Arch. Biochem. Biophys. 500: 92–106.
. 2012. Reactive oxidants and myeloperoxidase and their involvement in neutrophil extracellular traps. Front. Immunol. 3: 424.
. 2010. Leishmania donovani promastigotes evade the antimicrobial activity of neutrophil extracellular traps. J. Immunol. 185: 4319–4327.
. 2012. A SerpinB1 regulatory mechanism is essential for restricting neutrophil extracellular trap generation. J. Immunol. 189: 4574–4581.
. 2012. Endocytosis of soluble immune complexes leads to their clearance by FcγRIIIB but induces neutrophil extracellular traps via FcγRIIA in vivo. Blood 120: 4421–4431.
. 2009. Restoration of NET formation by gene therapy in CGD controls aspergillosis. Blood 114: 2619–2622.
. 2009. Histone hypercitrullination mediates chromatin decondensation and neutrophil extracellular trap formation. J. Cell Biol. 184: 205–213.
. 2008. Histone deimination as a response to inflammatory stimuli in neutrophils. J. Immunol. 180: 1895–1902.
. 2010. PAD4 is essential for antibacterial innate immunity mediated by neutrophil extracellular traps. J. Exp. Med. 207: 1853–1862.
. 2011. PAD4-mediated neutrophil extracellular trap formation is not required for immunity against influenza infection. PLoS ONE 6: e22043.
. 2011. Neutrophil elastase enhances sputum solubilization in cystic fibrosis patients receiving DNase therapy. PLoS ONE 6: e28526.
. 2011. Activation of the Raf-MEK-ERK pathway is required for neutrophil extracellular trap formation. Nat. Chem. Biol. 7: 75–77.
. 2009. Regulation of extracellular chromatin release from neutrophils. J. Innate Immun. 1: 194–201.
. 2014. Synchronized integrin engagement and chemokine activation is crucial in neutrophil extracellular trap-mediated sterile inflammation. Blood 123: 2573–2584.
. 2012. Afa/Dr diffusely adhering Escherichia coli strain C1845 induces neutrophil extracellular traps that kill bacteria and damage human enterocyte-like cells. Infect. Immun. 80: 1891–1899.
. 2013. Extracellular DNA traps in allergic, infectious, and autoimmune diseases. Allergy 68: 409–416.
. 2013. Neutrophil extracellular chromatin traps connect innate immune response to autoimmunity. Semin. Immunopathol. 35: 465–480.
. 2009. Netting neutrophils in autoimmune small-vessel vasculitis. Nat. Med. 15: 623–625.
. 2012. Felty’s syndrome autoantibodies bind to deiminated histones and neutrophil extracellular chromatin traps. Arthritis Rheum. 64: 982–992.
. 2008. Critical but overlapping role of FcγRIII and FcγRIV in activation of murine neutrophils by immobilized immune complexes. J. Immunol. 180: 618–629.
. 2002. Insoluble and soluble immune complexes activate neutrophils by distinct activation mechanisms: changes in functional responses induced by priming with cytokines. Ann. Rheum. Dis. 61: 13–19.
. 1994. Stimulation of reactive oxidant production in neutrophils by soluble and insoluble immune complexes occurs via different receptors/signal transduction systems. FEMS Immunol. Med. Microbiol. 8: 249–257.
. 1993. Activation of neutrophils by soluble and insoluble immunoglobulin aggregates from synovial fluid of patients with rheumatoid arthritis. Ann. Rheum. Dis. 52: 347–353. 1986. Altered function of synovial fluid granulocytes in patients with acute inflammatory arthritis: evidence for activation of neutrophils and its mediation by a factor present in synovial fluid. Inflammation 10: 443–453.
. 1991. Neutrophils isolated from the synovial fluid of patients with rheumatoid arthritis: priming and activation in vivo. Ann. Rheum. Dis. 50: 147–153.
. 2002. How antibodies to a ubiquitous cytoplasmic enzyme may provoke joint-specific autoimmune disease. Nat. Immunol. 3: 360–365.
. 2005. Mechanisms of blister induction by autoantibodies. Exp. Dermatol. 14: 861–875.
. 2001. Goodpasture’s disease. Lancet 358: 917–920.
. 2012. Syk-dependent signaling pathways in neutrophils and macrophages are indispensable in the pathogenesis of anti-collagen antibody-induced arthritis. Int. Immunol. 24: 539–550.
. 2002. Inhibition of the spontaneous apoptosis of neutrophil granulocytes by the intracellular parasite Leishmania major. J. Immunol. 169: 898–905.
. 1984. The role of myeloperoxidase and superoxide anion in the luminol- and lucigenin-dependent chemiluminescence of human neutrophils. Microchem. J. 30: 135–146.
. 1984. Intra- and extracellular events in luminol-dependent chemiluminescence of polymorphonuclear leukocytes. Infect. Immun. 45: 1–5.
. 2013. Flavonoids and 5-aminosalicylic acid inhibit the formation of neutrophil extracellular traps. Mediators Inflamm. 2013: 710239.
. 2012. Infection with Anaplasma phagocytophilum activates the phosphatidylinositol 3-kinase/Akt and NF-κB survival pathways in neutrophil granulocytes. Infect. Immun. 80: 1615–1623.
. 1990. Soluble and insoluble immune complexes activate human neutrophil NADPH oxidase by distinct Fc gamma receptor-specific mechanisms. J. Immunol. 145: 3026–3032. 1987. Lucigenin chemiluminescence in the assessment of neutrophil superoxide production. J. Immunol. Methods 97: 209–213.
. 1991. Scavenging effect of 5-aminosalicylic acid on neutrophil-derived oxidants. Possible contribution to the mechanism of action in inflammatory bowel disease. Biochem. Pharmacol. 41: 1001–1006.
. 2013. Ascorbate and α-tocopherol differentially modulate reactive oxygen species generation by neutrophils in response to FcγR and TLR agonists. Innate Immun. 19: 152–159.
. 1997. The high-affinity FcγRI on PMN: regulation of expression and signal transduction. Immunology 92: 544–552.
. 2008. Fcγ receptors as regulators of immune responses. Nat. Rev. Immunol. 8: 34–47.
. 1994. Modulation of Fc gamma and complement receptor function by the glycosyl-phosphatidylinositol-anchored form of Fc gamma RIII. J. Immunol. 152: 5826–5835.
. 2005. FcγRIIIB stimulation promotes β1 integrin activation in human neutrophils. J. Leukoc. Biol. 77: 787–799.
. 2003. Cross-talk between Fc receptors and integrins. Immunol. Lett. 90: 137–143.
. 1997. A role for Mac-1 (CDIIb/CD18) in immune complex-stimulated neutrophil function in vivo: Mac-1 deficiency abrogates sustained Fcγ receptor-dependent neutrophil adhesion and complement-dependent proteinuria in acute glomerulonephritis. J. Exp. Med. 186: 1853–1863.
. 2012. Neutrophil arrest by LFA-1 activation. Front. Immunol. 3: 157.
. 2012. Neutrophil extracellular traps that are not degraded in systemic lupus erythematosus activate complement exacerbating the disease. J. Immunol. 188: 3522–3531.
. 2013. Possible implication of disordered neutrophil extracellular traps in the pathogenesis of MPO-ANCA-associated vasculitis. Clin. Exp. Nephrol. 17: 631–633.
. 2011. Mast cells and neutrophils release IL-17 through extracellular trap formation in psoriasis. J. Immunol. 187: 490–500.
. 2011. Neutrophil extracellular trap formation is associated with IL-1β and autophagy-related signaling in gout. PLoS ONE 6: e29318.
. 2001. Essential role of neutrophils in the initiation and progression of a murine model of rheumatoid arthritis. J. Immunol. 167: 1601–1608.
. 2006. Granulocyte colony-stimulating factor and neutrophils: forgotten mediators of inflammatory disease. Nat. Clin. Pract. Rheumatol. 2: 500–510.
. 2012. Neutrophil extracellular traps contain mitochondrial as well as nuclear DNA and exhibit inflammatory potential. Cytometry A 81: 238–247.
. 2011. Neutrophil extracellular trap cell death requires both autophagy and superoxide generation. Cell Res. 21: 290–304.
. 2012. 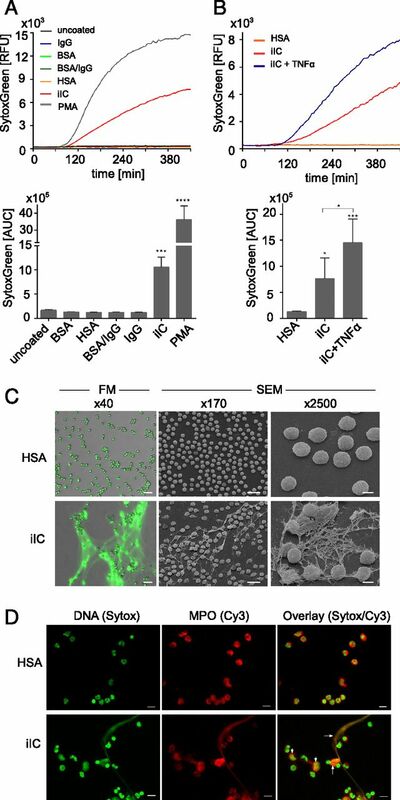 Hypochlorous acid regulates neutrophil extracellular trap release in humans. Clin. Exp. Immunol. 167: 261–268.
. 2013. Ligation of signal inhibitory receptor on leukocytes-1 suppresses the release of neutrophil extracellular traps in systemic lupus erythematosus. PLoS ONE 8: e78459.
. 2006. Fcγ receptors: old friends and new family members. Immunity 24: 19–28. 2002. Roles of Fc receptors in autoimmunity. Nat. Rev. Immunol. 2: 580–592.
. 1994. FcR γ chain deletion results in pleiotrophic effector cell defects. Cell 76: 519–529.
. 1998. Uncoupling of immune complex formation and kidney damage in autoimmune glomerulonephritis. Science 279: 1052–1054.
. 1999. Modulation of immune complex-induced inflammation in vivo by the coordinate expression of activation and inhibitory Fc receptors. J. Exp. Med. 189: 179–185.
. 1998. Resistance of Fc receptor-deficient mice to fatal glomerulonephritis. J. Clin. Invest. 102: 1229–1238.
. 1990. An abnormality of the gene that encodes neutrophil Fc receptor III in a patient with systemic lupus erythematosus. J. Clin. Invest. 86: 341–346.
. 1995. Neutrophil FcγRIIIb deficiency, nature, and clinical consequences: a study of 21 individuals from 14 families. Blood 86: 2403–2413. 2006. Activating and inhibitory FcγRs in autoimmune disorders. Springer Semin. Immunopathol. 28: 305–319.
. 1995. Function of human FcγRIIA and FcγRIIIB. Semin. Immunol. 7: 37–44.
. 2006. Differential kinase requirements in human and mouse Fc-γ receptor phagocytosis and endocytosis. J. Leukoc. Biol. 80: 1553–1562.
. 1992. Insoluble immune complex-stimulated neutrophil leukotriene B4 production is dependent on FcγRII and FcγRIII and independent of pertussis toxin-sensitive signal transduction pathways. Am. J. Pathol. 140: 613–620.
. 1991. Fc gamma receptor III induces actin polymerization in human neutrophils and primes phagocytosis mediated by Fc gamma receptor II. J. Immunol. 146: 997–1004.
. 1988. Modulation of human polymorphonuclear leukocyte IgG Fc receptors and Fc receptor-mediated functions by IFN-γ and glucocorticoids. J. Immunol. 140: 3467–3472.
. 1994. CR3 (Mac-1, alpha M beta 2, CD11b/CD18) and Fc gamma RIII cooperate in generation of a neutrophil respiratory burst: requirement for Fc gamma RIII and tyrosine phosphorylation. J. Cell Biol. 125: 1407–1416.
. 2013. An extracellular matrix-based mechanism of rapid neutrophil extracellular trap formation in response to Candida albicans. J. Immunol. 190: 4136–4148.
. 2012. Intravascular neutrophil extracellular traps capture bacteria from the bloodstream during sepsis. Cell Host Microbe 12: 324–333.
. 2007. Immunoreceptor-like signaling by β2 and β3 integrins. Trends Cell Biol. 17: 493–501.
. 2010. Fcγ receptors exhibit different phagocytosis potential in human neutrophils. Cell. Immunol. 263: 114–121.
. 2009. Neutrophil-specific deletion of Syk kinase results in reduced host defense to bacterial infection. Blood 114: 4871–4882. 1995. Protein kinase C: structure, function, and regulation. J. Biol. Chem. 270: 28495–28498.
. 2009. Crystal-induced neutrophil activation: XI. Implication and novel roles of classical protein kinase C. J. Immunol. 183: 2104–2114.
. 2013. The natural stilbenoid piceatannol decreases activity and accelerates apoptosis of human neutrophils: involvement of protein kinase C. Oxid. Med. Cell. Longev. 2013: 136539.
. 2003. Akt phosphorylates p47phox and mediates respiratory burst activity in human neutrophils. J. Immunol. 170: 5302–5308.
. 2004. Roles of PI3K in neutrophil function. Curr. Top. Microbiol. Immunol. 282: 165–175.
. 1996. Activation of p38 in stimulated human neutrophils: phosphorylation of the oxidase component p47phox by p38 and ERK but not by JNK. Arch. Biochem. Biophys. 334: 395–400.
. 2012. p38MAPK, ERK and PI3K signaling pathways are involved in C5a-primed neutrophils for ANCA-mediated activation. PLoS ONE 7: e38317.
. 1998. Role of stress-activated mitogen-activated protein kinase (p38) in β2-integrin-dependent neutrophil adhesion and the adhesion-dependent oxidative burst. J. Immunol. 161: 1921–1929.
. 2000. Maximal human neutrophil priming for superoxide production and elastase release requires p38 mitogen-activated protein kinase activation. Arch. Surg. 135: 219–225.
. 2005. Src and Syk kinases: key regulators of phagocytic cell activation. Trends Immunol. 26: 208–214.
. 1999. p38 MAPK signalling cascades in inflammatory disease. Mol. Med. Today 5: 439–447.
. 2009. Activation of the PI3K-Akt-mTOR signaling pathway promotes necrotic cell death via suppression of autophagy. Autophagy 5: 824–834.
. 2000. Distinct classes of phosphatidylinositol 3′-kinases are involved in signaling pathways that control macroautophagy in HT-29 cells. J. Biol. Chem. 275: 992–998.
. 2012. Autophagy mediates the delivery of thrombogenic tissue factor to neutrophil extracellular traps in human sepsis. PLoS ONE 7: e45427.
. 2004. Regulation of granulocyte apoptosis by NF-κB. Biochem. Soc. Trans. 32: 465–467.
. 2013. Regulation of neutrophil extracellular trap formation by anti-inflammatory drugs. J. Pharmacol. Exp. Ther. 345: 430–437.
. 2000. A direct linkage between the phosphoinositide 3-kinase-AKT signaling pathway and the mammalian target of rapamycin in mitogen-stimulated and transformed cells. Cancer Res. 60: 3504–3513.
. 2012. Mammalian target of rapamycin regulates neutrophil extracellular trap formation via induction of hypoxia-inducible factor 1 α. Blood 120: 3118–3125.
. 2013. Modulation of neutrophil apoptosis and the resolution of inflammation through β2 integrins. Front. Immunol. 4: 60.
. 1962. Myeloperoxidase of the leucocyte of normal human blood. I. Content and localization. Arch. Biochem. Biophys. 96: 465–467.
. 2013. Oxidative stress and autoimmune skin disease. Eur. J. Dermatol. 23: 5–13.
. 2002. Adjuvant treatment of patients with antineutrophil cytoplasmic antibody-associated vasculitis with vitamins E and C reduces superoxide production by neutrophils. Rheumatology (Oxford) 41: 274–278.